So today I have a super cool manicure to share with you! I've been wanting to do it for a while and I just love how this design turned out. The best part? It was super easy and fast to make, thanks to the awesome OMG Nail Strips! 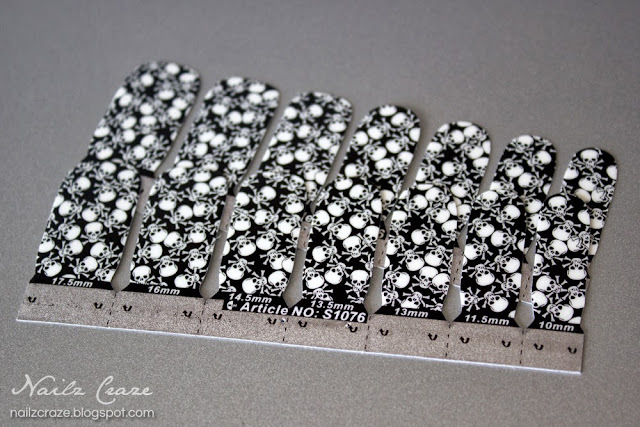 When I got the opportunity to choose the designs from OMG Nail Strips, this awesome Crossbones design was my first pick, so I was very excited to review it at the blog. These nail strips are exactly the same as the ones I reviewed in my previous post, so if you are curious to read about my first experience with these strips, be sure to check that post. The package contains 14 nail strips in various sizes, for me these were pretty much a perfect fit. They are not sealed completely so I think they will not ruin if you open the package and still be usable after a while, unlike real nail polish strips which will dry (and became unusable) unless the package is sealed. This time I learned from my mistakes, so I decided to file off the excess of these strips instead of pulling and removing them with acetone (like I did last time), which pretty much ruined the tips, since these are more like stickers than real nail polish strips). I'm glad I did it this way because this time I received a flawless look and the nail strips looked great! I would advice you to watch their instruction video before you apply these nail strips. I didn't apply a top coat for these photos because I didn't want the fast dryi top coat to shrink the edges at the cuticles, but after a few hours I felt like the nail strips were a bit tacky and that a top coat could have prevented it. They still look great, but I think I will add a clear nail polish on top just to get rid of the sticky feeling and keep the nail strips shiny and in place. I decided to spice up this manicure with some glitter, so I applied white nail polish on the ring finger and thumb, then topped it with one coat of China Glaze Glitz'n Pieces glitter which I think matches the OMG Nail Strips nicely. 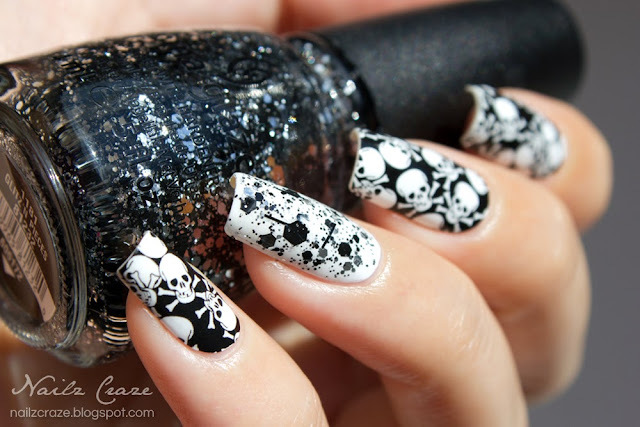 I hope you liked my black and white crossbones manicure, and that this review was useful for you. I would love to hear your thought about it! 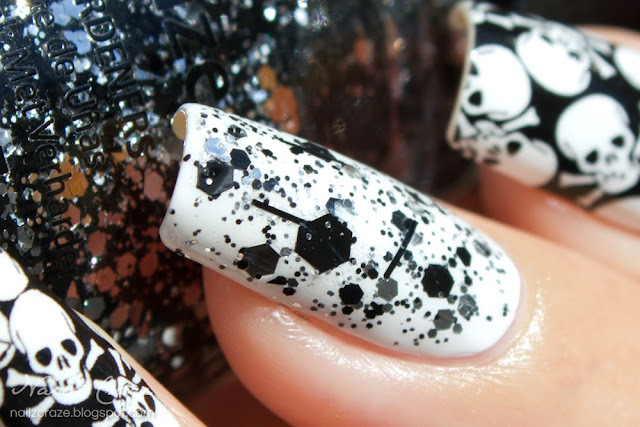 OMG Nail Strips offer a large range of nail strips and nail foils at their site, the price is affordable and not expensive at all, shipping is free worldwide. You can also find OMG Nail Strips on Facebook and Instagram. They look great and I love your accent nail! 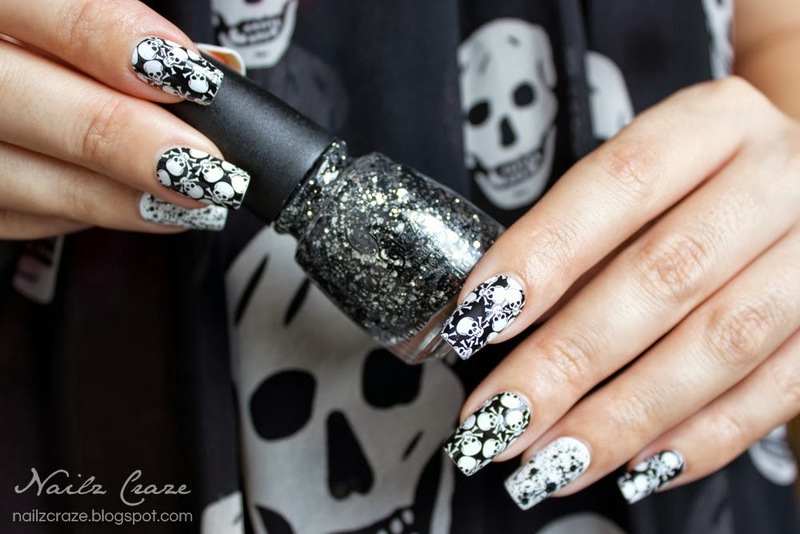 I loooove the combo with the glitter accent nails!